Pastor's sermon Sunday morning reminded me of a song that has taken a new level of meaning in my life. I don't think people realize just how easy it is for Satan to get his foot in the door of your life. I know that preachers frequently warn of it but until it happens to you, you tend to think "ahhh but I won't let that happen to ME!" Satan rarely comes at you straight off with something you would never do. It's a gradual descent, little by little, so subtle you may not notice. That's why it's critical to be sure your foundation is on CHRIST alone, not on works, not on standards or any thing else--because everything else can crumble beneath you as Satan chisels away at your so-called "standards" bit by bit. Donard had tests on Monday and saw the oncologist for a report on Tuesday. We never give up hope for a good report, but the doctor was not surprised that there were more new spots in both lungs, and the original ones had grown larger in the period without chemo since last November. Also, the tissue around what remains of the rib that was removed has grown. His CEA (cancer indicator from blood work) was around 7 in November and is now 18.2, the highest ever. It has been six weeks since surgery, and there is one drain tube remaining. The oncologist wants Donard to call when the last tube is removed and he is feeling better in order to schedule a new round of chemo, probably a repeat of a formula he had last fall. While the oncology report was not good, Donard's ability to be awake during the day is improving, and he is feeling better overall. We are grateful there are still absolutely no symptoms from the lung tumors, and as unbelievable as it sounds, pain from surgery has never been a major issue. Weaning off all the pain medication he has been on since December, however, is a very slow process. Physical therapy is planned to begin next week. When Donard is strong enough to return to work, the surgeon wanted him to begin with half-days at first, but Mustang does not want him to return until he can work full time. That may be another couple weeks. Your prayers, cards, calls, visits, and e-mails have been a continual source of encouragement to all of us. Thank you so much for being an important part of the recovery process, and we are very grateful for your continued prayers. Joel: "Don't kill me! I don't want to die!" Me: "Baby that's the point of the game. If you don't want to get killed don't play the game." Joel: "I don't want to be the point of the game!" Me: "Stop messing with Mom's work." Joel: "Buys the food and water and soda?" Me: "Yup buys the food and water and soda." I've done a bit of Googling and checking on Clearplay's site but haven't found anything that really addresses my problem. When watching a movie it randomly glitches and the video goes black for various amounts of time (from a split second to ten or more seconds). I thought at first there were scratches on the disc but have determined this is not the problem as it did that with a brand new movie that we opened and put straight in. The sound is never interrupted so I thought perhaps it was the cables we were using but those are also brand new. I intend to eventually give customer service a call but thought I would put this out in case anyone else has had this trouble. It has really made such a problem we avoid watching things on it (if we think we can get away with it at all we use the PS3). Almost four weeks after surgery, Donard has done well according to the doctors, but some areas are yet to improve. He is not gaining strength, sleeps most of the time, and his back and legs tire in just minutes. Blood pressure extremes continue to be an issue, as well. Little to no pain is the good news, and he was able to eliminate the morphine about two weeks after surgery. Since slowly reducing and eliminating the steroid, we are hoping the swelling in his face and neck will subside. One drain tube was removed last Tuesday, leaving only two in place, and the collection bottles were reduced in size, which has made everything simpler. We are grateful for many demonstrations of love that have encouraged us through recent weeks and for prayers that continue to strengthen and sustain us. Donard came home from the hospital Friday (Feb. 20) around 5:30 p.m. Micah (oldest grandson) spent the night here in case we needed him in the absence of an adjustable hospital bed or for any reason at all, but everything went well. Donard is very weak, and sleep consumes more time than being awake. Everything requires great effort, but we continue to be grateful for good pain control. For now we will concentrate on being content with baby steps of progress and attempting to discover a workable routine that keeps up with med schedules, drain tubes, wound care, bandage changes, and meals fitted somewhere among periods of rest, rest, and more rest. Thank you for every investment of time, expressions of concern, and especially for your faithful prayers. Being home four days ahead of schedule is just one of many evidences of God’s blessings. 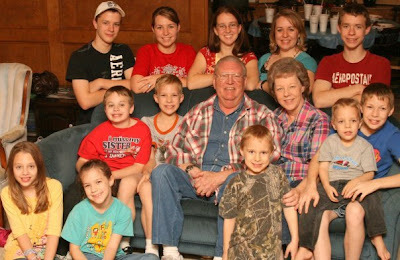 I realized that I haven't yet updated now that my Pappaw has come home from the hospital! He is still doing very well considering the major 12 hour surgery and was able to come home in less than time than they thought he might. He is getting around the house a little bit with the help of a cane. Thank you so much for your prayers and please continue them as he still has 6-8 weeks of recovery at home. I've gone awhile without posting anything "deep" but I have had this saved in my drafts intending to write it down for awhile. It kept being in the back of mind through various events in my life and in those of friends. As you go through the valley of the shadow of death you often wonder--okay God you said that ALL things work together for good but I just don't know HOW you can mean this to be good! I've asked that myself many times over the last few years. How can this be good? It isn't even YOUR WILL that these things should happen, we know it from Your Word! How can You let it and how can it be GOOD? I mean some of the testings in the Bible I think well duh, God made good out of that sad situation--but that wasn't a situation that seemed to go against His Will. During one such time of pondering I had one of those light bulb experiences...God didn't say that it WAS good but that it would work together FOR good. A simple thing to some but a dramatic difference to myself and the way my silly little mind works. When I looked back over the events of the last several years it amazed me just how many "good" things had happened because of the place I was in. Things that would never have happened if I hadn't been there and yet they were able to happen because of the trials and testing God lead us through. It has been hard, and it has hurt and still hurts and we are still in that valley but as I looked back I could not wish any of those things away. If you had asked me five years ago to choose a path and shown me all the hurt and despair of this road I still can't say honestly I would have chosen this path. But I have seen how God can use this FOR good in my life and in the lives of my family. And perhaps one day I will say that I would gladly walk through that path again for the good that it brought...but right now I am just clinging to faith and hope that God knows what He is doing and that we are walking through the valley of death. "The doctors seem to be surprised at how well Donard has done in only 4 days post surgery, and we give God all the glory! It is possible that he won't have to be in the hospital for the expected two weeks. Being in a significantly weakened condition for some time before surgery has made getting out of bed, sitting, and standing require even more effort than would have resulted from surgery alone. The smallest tasks are exhausting, resulting in extra sleep during the day as well as at night. We have to keep reassuring him that family members are there to assist when he needs help and not to visit. It is okay to sleep, and visiting can come when he is well again. MD Anderson is strong on pain control, and for that we are very grateful. Donard has experienced no nausea and is in good spirits. Thank you so much for all your prayers and expressions of love!" "My nose is running out!" This was a bit longer of an update because the main doctor was finishing up and came out to personally fill the family in. He says overall his part went well, took longer because the tumor had to be drilled out of the bone (usually the bone is softer in radiation patients and can almost just be scooped out). He had to have a small infusion of blood, some extra platelets because of the length of the surgery (it is much longer than anticipated). The titanium cage was not needed, only two ribs were removed and some sort of concrete filling was made to go in the place of the ribs. The doctor was very optimistic and said things went very well and says Pappaw should be back up on his feet in no time (hah hah!). He did say that the cancer was invading one of the ribs quite a lot and expanded it to 3 to 4 times it's normal size which could be what Pappaw had been interpreting as gall bladder pain. This is good news in that it seems a lot of Pappaw's pain should be relieved after the recovery. Plastic surgeon started about 6:30. His job is to somehow pull the muscles up over the concrete so that it does not rub directly against Pappaw's skin. If he is able to do it the preferred way it will take him two hours, but if he has to do something they referred to as a flap it could take three to four hours so we are definitely still in this awhile longer. Thank you for your continued prayers!!! Pappaw's surgery begins around 7 AM tomorrow morning. Your prayers are greatly appreciated! I will try to keep updates posted on my facebook/twitter status as they are available. We have had lots of sick kids around here lately!! Starting on Friday last week several of them began running fevers and coughing. By Sunday six of them were sick from Luke all the way down to Joel. They've been pretty pathetic and the couches have been covered with invalids huddled under throws. ;-) Reuben in particular has been spiking some high fevers several days in a row (in excess of 103). The others seem to be mostly better although there are a few fevers here and there. Me: "Why aren't you watching Macgyver with Joel?" Reuben: "I'm going to throw up on Mom's bed!" Me: "You think you're going to throw up??" Me: "Micah can you give him a bucket?" Joel: "I need a bucket too." Joel (in his most pathetic voice): "I'm sick." Here is the latest update from my grandmother about Pappaw. Numerous complications have delayed updates, a downed computer being just one. Thanks to Micah’s efforts (our oldest grandson), we are back online again. Donard is scheduled for surgery on February 10, 2009. The projected 8-hour surgery will involve removal of the 10th rib (right side) and one to three vertebrae. A titanium cage with rods on each side held in place with screws will replace the vertebrae. The hospital stay is expected to be two weeks with additional rehab possible. A variety of neurological symptoms led doctors to the conclusion that this area must be addressed through surgery, since chemo had no positive results there and all other options are exhausted. Delaying surgery could ultimately result in paralysis. Disease in the lungs will continue to need treatment after surgery recovery. Needless to say, we may be out-of-touch for a lengthy period of time. There may be opportunities to read e-mail, so please continue to send us your news. We may have little or no time to reply, but we will welcome any connection with the outside world. We are grateful for your notes of encouragement and for your prayers on our behalf. “This I recall to my mind; therefore have I hope. It is of the Lord’s mercies that we are not consumed, because His compassions fail not. This post is the culmination of a great deal of discussion and meditation. I'm not sure that I have it still completely put into words yet but I've definitely finally thought of a way to put down something I've been meaning to blog about. As our preferences and convictions have developed over the years there was always something that I couldn't put my finger on that seemed to separate things into two categories. Today it kind of sort of clicked. As I've made decisions about what things I participate in and what things I don't there was always a struggle. What would God think of this? How does this fit? The Bible doesn't really address this or that issue. How do I know what He wants me to do? Some people say that a certain activity is wrong and some think it is okay. Why the difference between one Christian to the next? Obviously we all have to hear from God about what He wants us to do but something that has helped me to better understand it is that there are essentially two different kinds of activities I should not participate in. One kind of thing would be the things God clearly spells out in the Bible--thou shalt not kill, thou shalt not steal, you know the drill. The second type is the one that usually causes all the division however--things that we abstain from because of the appearance of evil. What kinds of things appear evil can change through the years. Something considered wrong in Bible times won't necessarily be considered wrong today and vice versa. Here is the key--to focus on the principle, not the application of it. Don't get so wrapped up in specific applications of things that you forget the point of it. For example, modesty can not be defined. You can't give someone exact guidelines on exactly how their clothes should fit and know that will always make them modest. Some of modesty is attitude and how you wear your clothes. If you have completely modest clothing but act like the woman Proverbs warns us about, you are not modest. Something that made even more sense to me was when Dr. Innes who we heard speak at The Wilds used the example of playing pool. Years ago pool was seen as something associated with drinking and worldly behavior. Now it does not have the same connotations and we can play pool without those same appearances of evil. It is all about the principle not the application of it. Josiah: "Be glad you only have to double buckle with Joel--"
Me: "Just knock it off right now!" Emma: "I wasn't saying anything!" Me: "But every time you have to double buckle we end up with this conversation. Do you remember how long we were crammed in a station wagon and the AC didn't work very well in the back? The missionaries in St. Lucia don't even HAVE seat belts!" Reuben: (in a very Steve-Martin-Clouseau voice) "Good one Megan." Me: (slightly flustered) "What did you say??" Reuben: "Good one Megan. You know like when he kicks the guy under the table..."
Emma: "It's like an air refreshner!" Reuben: (singing as he runs across the house) "I need to go to the bathroom really bad...I need to go to the bathroom really bad..."
During prayer time lately Joel and Reuben have begun praying for each person by name. While cute and sweet this has sometimes been slightly annoying as they don't do any rhyme or reason to it and forget who they have prayed for and who they haven't. Tonight after Joel did his Reuben had a slightly different prayer than normal. "Thank you God. I pray for Micah the stinkiest." Snickers went all around as we had just been giving Micah a hard time about not putting on enough deoderant. "Luke the awesome one." Elbow jabs and more snickers. "Megan the prettiest. Haley the not prettiest." Some of the kids were laughing by this point. "Josh the meanie head." More chuckles and Reuben is definitely feeding off the crowd. He walks around pointing to each person as he prays for them. "Emma the lamest. Joel the coolest. Mom the prettiest. Josiah the coolest." I don't probably ask for prayer often enough for my Pappaw. As some of you know things have been very rough for awhile now and it seems to be getting worse. This is the last update my grandmother wrote. Today was the appointment date and they were gone to the Dr most of the day I think. We really covet your prayers right now. The tumor marker was down a little, but it appears from the CT scan that some areas in the lung are possibly slightly increased. More importantly, the MRI revealed that the tumor surrounding the vertebrae has definitely progressed and is beginning to put pressure on the spinal cord. Some of what we have blamed on chemo side effects are likely symptoms of that pressure, and he is again experiencing some pain. The neurosurgeon ordered a steroid to hopefully reduce inflammation and reduce pain until after the holidays.